Recover what has been lost, forgotten, taken away. 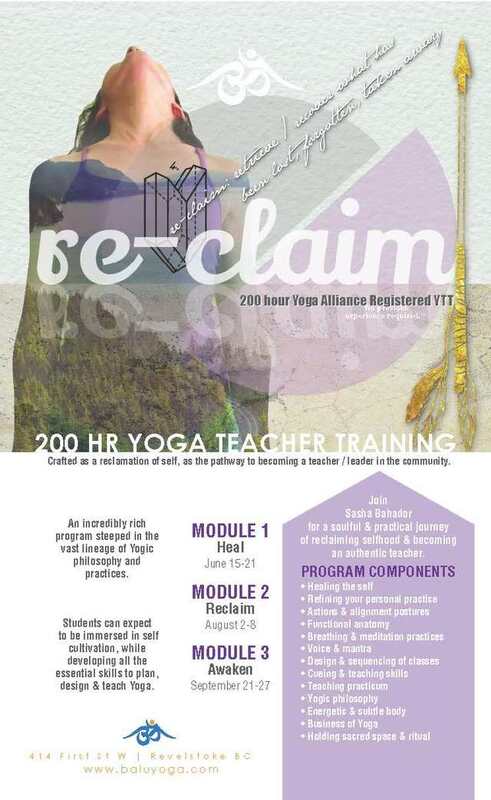 This 200 hour Yoga Alliance registered teacher training, has been crafted as a reclamation of self, as the pathway to becoming a teacher | leader in the community. This incredibly rich program is steeped in the the vast lineage of Yogic philosophy & practices. design & teach Yoga. Join Sasha Bahador for a soulful & practical journey of reclaiming selfhood & becoming an authentic teacher. Sasha’s offerings pour out of a poetry soaked heart & an old soul. Her calling is to facilitate connection & eradicate separation. To gather and witness us humans reclaim what has been forgotten & laid dormant. Our bodies, relationships, and lives are full of magic and awe. Humans, just like nature & the cosmos are pure ecstatic life force desiring to express itself. To awaken to the ceremony of our own lives requires us to heal and reclaim our selfhood, from which point all else will echo. Sasha graduated from university with a Kinesiology degree & worked for 10 years as a trainer & athletic coach until the spirituality of Yoga intersected that path. For the past decade since then, she has been a teacher and facilitator of Yoga classes, training’s and retreats. For the past 3 years, her soul found a new home within the sacred realm of Shamanic studies & earth medicine ceremonies. Her old soul has an ancient calling to commune with the spirit in everything. Sasha integrates these vast lineages of Body Wisdom, Yoga and Shamanic ceremony together for an offering to heal herself and whomever else is seeking the same.